We explore the way how biomolecules such as proteins (involving enzymes) and functional nucleic acids (DNA and RNA) work at atomic resolution based on structural biology with NMR. We determine both static and dynamical structures with the aid of our own development of the new methodology and elucidate the underlying mechanism of functions of these biomolecules. Structural biological approach is also applied to analyze components of wood biomass at atomic resolution. The analysis is usefule to develope the way to extract energy and valuable materials that can be used as starting materials of various products from the wood biomass. Thus, we pursue to contribute to the paradigm shift from oil refinery to biorefinery. Followings are main research achievements in the year of 2018. We have developed a new way of sample prepa-ration of wood biomass for the analysis by a solution NMR method. This new preparation brings much sharper NMR signals and much better signal to noise ratio. As a result, it is possible to analyze all compo-nents of whole wood biomass in an intact state (no artificial chemical modification) at atomic resolution (Figure 1). We have also developed the method to accurately quantify the components of wood biomass with NMR. We have applied the developed method to monitor the bio-degradation of wood biomass by fungi. Selective degradation of either cellulose or lignin depending on a kind of fungi used was successfully detected. Thus, our NMR method has a wide range of application to identify various components of wood biomass and to monitor their conversion. Figure 1 1H-13C HSQC spectrum of wood biomass. 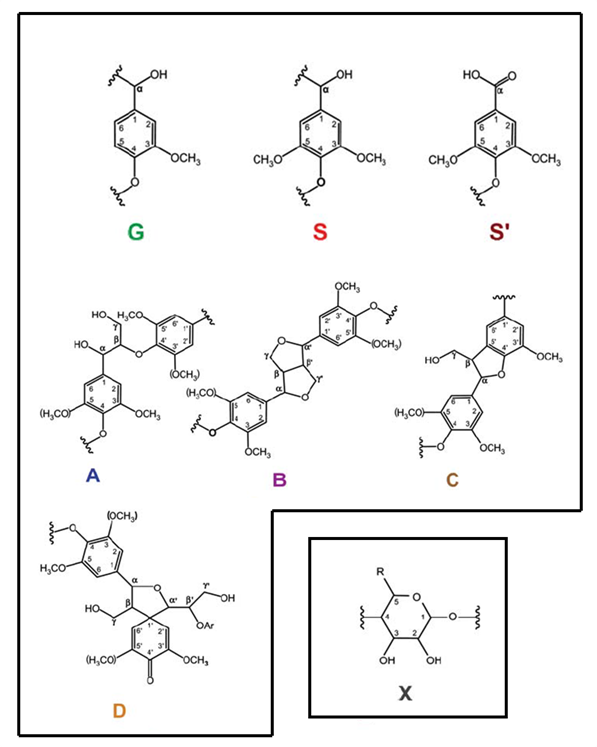 Identification of cellulose and lignin substructures is illustrated. The lignin-carbohydrate complex (LCC) found in the recalcitrant woody biomass is a complex of lignin and hemicellulose. Fungal glucuronoyl esterases (FGEs) catalyze cleavage of LCC at the ester bond formed between an alcohol group of lignin and the xylan-bound 4-Omethyl-D-glucuronic acid of glucuronoxylans. Here, we built a phylogenetic tree from about 400 putative FGEs obtained on BLAST analysis and defined six main clades. We then found that FGEs of C. subvermispora and P. eryngii belong to clades V and II, respectively, and that FGEs of these clades have not been studied yet. We developed high-yield Pichia pastoris expression systems of the catalytic domains of FGEs of C. subvermispora (CsGE) and P. eryngii (PeGE). We then used benzyl glucuronic acid to confirm the activities of these FGEs. Firstly, we developped the improved protocol to accurately measure the activity. We successfully quantified the hydrolyzed product, glucuronic acid, spectrophotometrically with higher accuracy using our new protocol. It turned out that PeGE exhibits the highest acitivity among FGEs reported so far. Then, we demonstrated that PeGE exhibits high tolerance toward verious denaturing agents, which may make it a potentially more applicable enzyme. Glutathione (GSH) S-transferases (GSTs) are en-zymes that catalyze the reactions involved in detox-ification and metabolic pathways. We previously developed high-yield E. coli expression systems of two GSTs of C. subvermispora, CsGST63524 and CsGST83044, and characterized their activities. Here, we solved the crystal structures of the CsGST63524 in ligand-free and GSH-bound forms at 2.45 and 2.50 Å resolutions, respectively. It was found that the res-idue located closest to the sulfur atom of glutathione for hydrogen bonding is Ser21, which indicated that CsGST63524 is a serine-type GST. Functional mu-tagenesis unexpectedly showed that Ser21 is not es-sential for the enzymatic activity, but interestingly revealed that non-canonical amino acid residues, Asn23 and Tyr45, are enzymatically important. We have also identified the putative substrate binding site, which comprises mostly hydrophobic residues, of CsGST63524 (Figure 1). This is reasonable be-cause many of the substrates that CsGST63524 tar-gets are hydrophobic. Additionally, relatively large GSH-bound pocket of CsGST63524 rationally ex-plains its substrate-preference. Figure 2 Close-up surface representation of the putative substrate-binding site of CsGST63524 located near the GSH-binding site. Lignocellulosic biomass, which comprises cellulose, hemicelluloses, and lignin, is the most abundant re-newable carbon resource. The production of bio-based fuels and value-added chemicals from lignocellulosic biomass is attractive, because it has a potential of partial replacement of fossil resources and to overcome environmental issues. Saccharifica-tion of lignocellulosic biomass using cellulolytic enzymes is ideal regarding isolation of the compo-nents intact. However, nonproductive binding of lignin to cellulolytic enzymes has been problematic and need to be avoided. It has been known that car-bohydrate-binding modules (CBMs) of cellulolytic enzymes strongly bind to lignin, but the adsorption mechanism at molecular level is still remained elu-sive. Here, NMR-based identification of binding sites on CBM1 of cellobiohydrolase I (Cel7A) from a hyper-cellulase-producing fungus, Trichoderma reesei, toward cellohexaose and lignins from Japa-nese cedar (C-MWL) and Eucalyptus globulus (E-MWL) was carried out. Firstly, we developed E. coli expression system of TrCBM1, and preparation method to obtain properly folded and stable iso-tope-labeled TrCBM1. 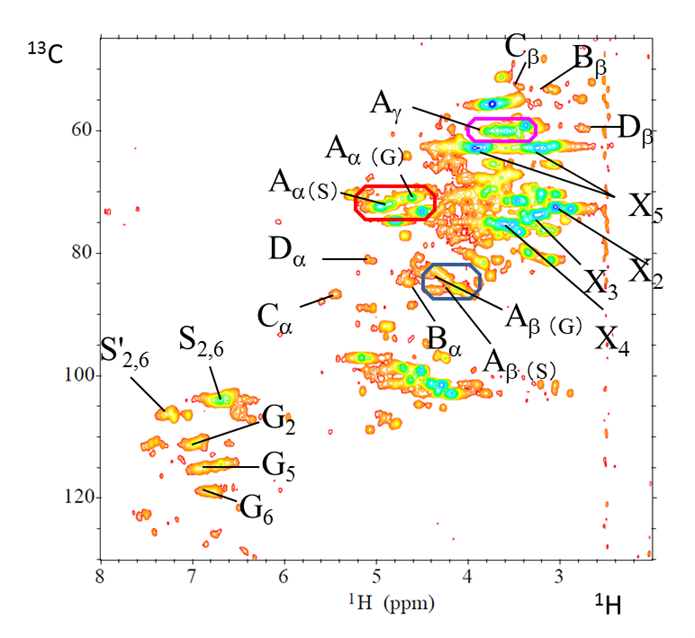 Chemical shift perturbation analyses revealed that TrCBM1 adsorbs cellohex-aose highly specifically using two subsites, flat plane surface and cleft, which were located on the opposite side of the protein surface. On the other hand, MWLs, which exhibited higher affinity than cellohexaose toward TrCBM1, were adsorbed using multiple binding sites, including the subsites. Of the residues belonging to the flat plane surface, Gly6 and Gln7 were involved in lignin binding, while Asn29 and Gly34 in cellohexaose binding (Figure 2). It turned out that much larger surface area was used in TrCBM1 to bind with C-MWL than E-MWL. This indicates that the mech-anisms of adsorption toward hardwood and softwood lignins are quite different. 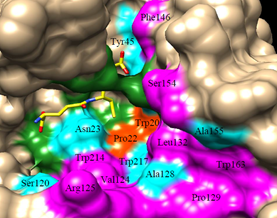 Figure 3 Binding site mapped on the TrCBM1 model structure. (Top) Binding sites of cellohexaose (left), and C- and E-MWLs (right), respectively. 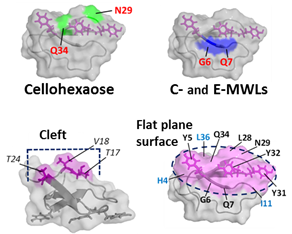 (Bottom) Common binding sites of cellohexaose, and C- and E-MWLs. APOBEC3F (A3F), a member of the human APO-BEC3 (A3) family of single-stranded (ss) DNA cyti-dine deaminases, acts as an anti-human immunodefi-ciency virus 1 (HIV-1) factor by deaminating deox-ycytidines to deoxyuridines in the complementary DNA of the viral genome. Previous studies on A3F were mainly focused on its interaction with an ac-cessory protein of HIV-1 known as a viral infectivity factor, while a full understanding of the deamination behavior of A3F awaits further investigation. Here, we investigated the ssDNA-length-dependence of the deaminase activity of the C-terminal domain (CTD) of A3F. The use of the N214H mutant of A3F-CTD, which exhibits higher deaminase activity than the wild-type, facilitated tracking of the reaction on the real-time NMR time scale. It turned out that A3F-CTD efficiently deaminates the target deox-ycytidine in long ssDNA with a low ssDNA concen-tration ([A3F-CTD] >> [ssDNA]), while the target deoxycytidine in short ssDNA is deaminated effi-ciently by A3F-CTD with a high ssDNA concentra-tion ([A3F-CTD] << [ssDNA]). This property of A3F is quite different from that of the previously studied A3 family member, A3B. In the case of A3B, deami-nation of the target deoxycytidine in short ssDNA is more efficient than that in long ssDNA; the concen-trations of the protein and ssDNA had no effect. This unique property of A3F is rationally interpreted on the basis of its binding characteristics as to ssDNA. We have identified how RNA aptamer binds to and traps a full-length prion protein that causes prion diseases such as mad cow disease. RNA aptamer forms a dimeric architecture and each monomer sim-ultaneously binds to the two sites located in the N-terminal flexible region of the prion protein, re-spectively (Figure 3). Electrostatic and stacking in-teractions contribute to the binding at each site. 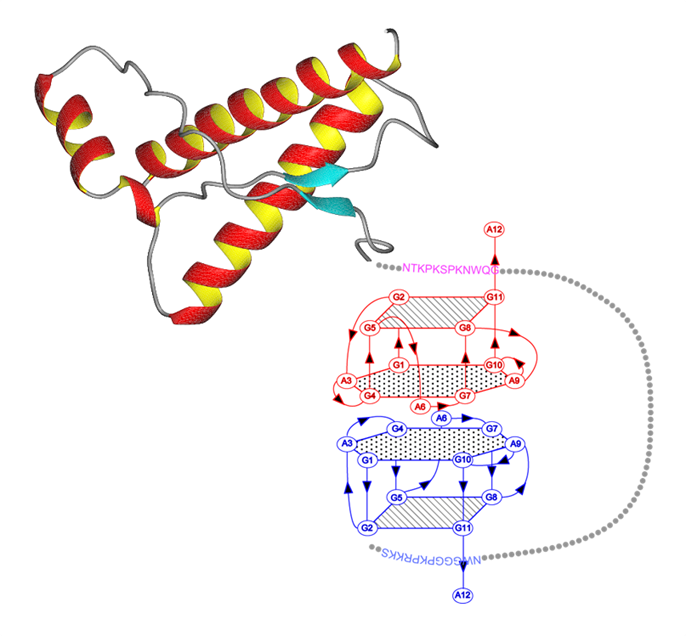 The tight binding (trapping) inhibits the conversion of prion protein into an abnormal form related to diseases, which would result in repression of prion diseases. Cell-based assay to confirm this idea is in progress. Figure 4 The way how dimeric RNA aptamer traps full-length prion protein. 611-0011 Gokasho, Uji-shi, kyoto. Main Building W211-E.
5 min from Obaku(黄檗) station, JR Nara-line or 8 min from Obaku (黄檗), Keihan railway co. by walk.